You’re invited to attend the 2015 ADI Expo Training Series and One Day Sales event coming to your town. The schedule is set, and our team is wrapping up the final details on this year’s program and we are confident you will find it to be an extremely valuable experience. With over 150 participating manufacturers, the ADI Expo kicks off later this month and will visit 46 cities across North America. We’ve added new locations for 2015 in Omaha, Buffalo, Des Moines, and Hartford. 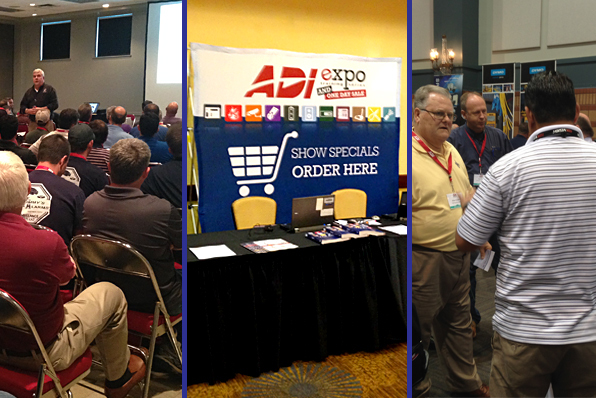 The ADI Expo offers a full day packed with training seminars and new product demonstrations to provide attendees with the tools and resources needed to grow in today’s market. Free for all industry professionals, the ADI Expo provides a great forum to meet one-on-one with manufacturers, network with industry peers and share best practices. The open exhibit floor will be available twice-a-day to accommodate all schedules, and to make sure dealers have enough time to visit with all manufacturers. We’ve taken feedback from our customers and put together a full roster of fresh training opportunities this year focused around some of the latest technologies and emerging trends. Attendees can choose from courses in IP, Video Surveillance, Networking, Integration, Intrusion & Z-Wave, Residential & Commercial AV, and more. And there will be a greater opportunity to participate in national, local and industry accredited courses. In addition to training, the ADI Expo provides great savings opportunities with the one-day sales promotions that will take place. Participating manufacturers will offer generous show specials on products purchased during the events. Just look for the Save More flags around the Expo and follow the flags to savings. There will also be time to have some fun at the events. Attendees will have a chance to enjoy some good food and beverages, pick up cool giveaways, and enter to win an assortment of door prizes throughout the day including a Bose® Wave ®SoundTouch ™ music system. And don’t forget to enter to win a brand new Dodge Challenger through ADI’s Customer Appreciation Car Giveaway sweepstakes. There has never been a more exciting time for our industry that has offered so much growth opportunity, and we want to help you take advantage of it. Click here to find out when this must-attend event will hit your area, and be sure to register online to reserve your space. See you there!